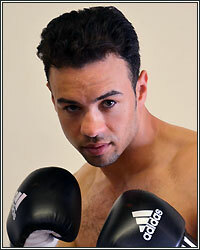 DELVIN RODRIGUEZ: "I'M DEFINITELY NOT TRYING TO LEAVE IT I NTHE HANDS OF THE JUDGES"
"I feel stronger than ever at 154. I'm 6 feet tall, so I was struggling to make the weight [147 pounds] for a year and a half. I went to 154 and I believe people saw how strong I was. I got stronger as the fight went on. I feel like my body is fully developed and I'm looking forward to it. I'm training harder than I did for the first fight and I know it's going to be a great fight...I don't go in the ring thinking about the knockout, but for this fight, I'm definitely not trying to leave it in the hands of the judges. If I see the slightest of opportunity where I can press, then I'm going to press and get the knockout," stated jr. middleweight contender Delvin Rodriguez as he talked about his highly-anticipated rematch with Pawel Wolak on the undercard of the December 3 pay-per-view event headlined by Cotto vs. Margarito. Check out what else he had to say! PC: You finally get the rematch against Pawel Wolak and it's on the biggest stage that you can ask for. How do you feel about it, man? DR: I gotta say, it's very exciting, man. To be fighting on HBO pay-per-view with a champion like Cotto and Margarito, it's going to be a very exciting thing. To be back at Madison Square Garden in New York, what else can I ask for? I signed the contract yesterday and I had to go to the gym and burn some of the excitement I had off. It's a great feeling. PC: You felt like you won the first fight, although it was ruled a draw. With that being said, are you going to approach this fight the same way that you approached the first one? DR: I have been watching the tape and watching the fight and we have already been working on a different approach. I mean, it's pretty much the same. Of course we gotta keep a little bit of distance, but I think this time, I'm going to try and push him back. He's not stronger than me, so I just have to stay firm and throw more power punches instead of moving around too much. I mean, I'm not going to go crazy and throw a ton of power punches and get myself tired, but we have a little bit of a tweak in there for this fight. PC: It's rare that we see a fight that was great on ESPN2 be rematched on pay-per-view on such a big stage. When Pawel was trying to set up a fight with Bundrage, did you start to think that this fight was gonna get away from you? DR: Oh yeah! To be honest with you, I was thinking there is no way I was going to get this rematch before the end of the year. I didn't think there was no way it was going to happen. If it was going to happen, I was thinking maybe sometime next year, but, you know, I gotta thank Star Boxing, Joe DeGuardia, and A.J. Galante, my manager, for putting this all together. They really came through and it's a great experience for me and I'm very happy with it. PC: This is your second fight with A.J. Galante as your manager and so far so good. He's been really working and landed this fight for you. How is it working with a guy so young, but so passionate and driven at the same time? DR: A.J. is a great manager and a great friend. He's not just my manager; we have become friends. We have a great team. The best thing about this team is we are very hungry to go forward, we are very positive, and we are confident. We work hard, man. A.J. is a very hardworking guy. I just say, "A.J., this is what I need to do," and we just work at it. He's not a guy that says, "I'm going to do this," and I just wait and wait and wait. If he tells me something, he definitely goes to work and tries to get it. So it's been a great change and, like I said, we have a great team. Fernely Feliz, Matt Petren, my strength and conditioning coach, and of course A.J. Galante, my manager. I can't ask for a better team than what we have now. PC: Not only are you fighting at the correct weight class now, but the fight is December 3rd, so you will also have a full camp, which is something you didn't have the luxury of in the past. How much do those two things factor into this fight? DR: I feel stronger than ever at 154. I'm 6 feet tall, so I was struggling to make the weight [147 pounds] for a year and a half. I went to 154 and I believe people saw how strong I was. I got stronger as the fight went on. I feel like my body is fully developed and I'm looking forward to it. I'm training harder than I did for the first fight and I know it's going to be a great fight. PC: Are you entering this fight with the feeling that you have to stop Wolak to walk away with your hand raised or do you feel if you do a little bit more than you did the first time, you won't be denied? DR: I'm the type of fighter where I don't go in the ring thinking about the knockout, but for this fight, I'm definitely not trying to leave it in the hands of the judges. If I see the slightest of opportunity where I can press, then I'm going to press and get the knockout. PC: What was your initial reaction when you found out that you had secured this fight? DR: Ah man, it was a great feeling for me and it's great for the fans. You know, I told everybody before the first fight that it was going to be a great fight and now that I'm getting the rematch, we're going to pick up where we left off. It's a great opportunity for me to fight in Madison Square Garden on the undercard of a pay-per-view. I gotta tell you, man, I think this is the most excited I have been in a long time. If you have followed my career, I have been very up and down. This really gets me excited and gets me happy. PC: When you think of great rematches that lived up to the first fight or surpassed it, you think Gatti/Ward, Ali/Frazier, Robinson/LaMotta, but it's rare. Do you feel this rematch could live up to the first fight or even surpass it? DR: Yeah, I have no doubt, man. Pawel Wolak is a very strong fighter, very determined, and this kid is not going to back up. I'm sure that he will rush in more this time and really put the pressure on in this one. My style...like I told you, I'm training harder than ever and I'm going to be in better shape than I have ever been in my career, and that's what's going to make this fight. I'm going to be in shape to respond to everything that he's got. The style that we have is going to make the fight. There is no doubt in my mind that this is going to be a great fight. It might be even better than the first one. PC: I can't wait to see the fight. We will be speaking a lot leading up to the fight. I'm sure there are some people you want to thank that made this possible. DR: Oh yeah, I want to thank my manager, A.J. We went down yesterday and signed the contract. It was so much fun. It was an exciting moment for us. We have only been together...this will be our second fight together and look where we are. I mean, we are fighting on pay-per-view. I gotta thank A.J. Galante, who is a young kid, but he is very smart and very determined and hardworking, so I gotta give all of my respect to A.J. Galante.